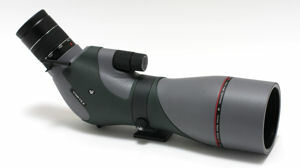 Vortex released their highest-quality spotting scope, the Razor HD, in mid-2009. We couldn’t review it then because Razor HD scopes were only available in limited numbers and people kept buying them before we could finish the article! Now that the supply is more secure, we finally kept one long enough to examine the issue of why Razor scopes are so popular. It comes down to a question of value: how much performance do you get for your money? In the 80-mm class of HD-glass spotting scopes, there are a number of excellent options, but all of them cost at least $2500 for just the scope body and eyepiece. The Vortex Razor is an 85-mm spotting scope that delivers the performance of a large HD-glass scope with a 20-60x zoom eyepiece and a great carrying case for just $1,599.99 . That’s a great value, and that’s why it’s doing so well. The Razor HD is very bright and sharp right to the edge of the field of view. Color fidelity is good; we noted a slight magenta color bias during testing. There was minor color aberration on brightly-lit, high-contrast objects, but no more than is usually seen in these tests. One aspect of the Razor’s optical properties that really impressed us was its flat-field performance. When we say it stays sharp to the edge, we really mean it! There was a bit of distortion at the very edge of the field, seen as a tendency for straight lines to bow inward, but this was relatively minor and not beyond normal. People who regularly peruse optics literature will know that much of the optical performance of any product has a lot to do with the coatings on the lenses and prisms, in addition to the quality of the glass. In the Vortex Razor HD scope, the lenses are arrayed as a triple apochromatic (three differently-shaped lens elements that refocus all the visible light wavelengths to the same focal plane), and two of these lens elements are HD (high density, low-dispersion) glass. Vortex uses a variety of coatings to achieve different ends, two of which are worth noting here. The XR multi-coating enhances light transmission and improves image resolution, while the ArmorTek is a coating chemically bonded to the outer lens surface which is harder and more scratch-resistant. This coating has the additional benefit of shedding oil and dirt, rendering the lens easier to clean and more resistant to corrosive properties of fingerprints. What does all this mean to the average person? Well, look through the Razor! It’s bright, it’s sharp, and it doesn’t smudge so much! That’s what it means! Currently, the Vortex Razor HD is only available in an angled configuration. We do not know if Vortex has plans to release it in a straight version or whether it will also eventually come out in a 65-mm size. The Razor is fairly compact at 15.25 inches in length with the zoom eyepiece in place. Weighing 65.7 oz. (just over 4 lbs), the Razor HD scope is a bit lighter than average for a full-sized scope, especially when you figure in the mass of an 85-mm objective lens. Part of this is due to the magnesium alloy frame, which is a bit lighter and more durable than aluminum would be. The Vortex Razor scope has a distinctive look, being primarily light gray with a textured green skin that improves handling over part of the prism housing and barrel. The eyepiece and focus knobs provide a black accent to the package. The barrel has a lens hood which should be deployed to reduce flare. There is a plastic sighting tube on the right side of the lens mount that works reasonably well. The Vortex Razor HD is fully sealed and argon-purged to be completely waterproof, dust-proof and internally fog-proof. In common with most of its cohort, the Razor HD angled scope has the tripod mount attached to a ring. The body of the scope rotates within that ring when a set-screw is released. We noted a peculiarity about the Razor with regards to this. The scope will rotate counter-clockwise (from the eyepiece end perspective) until it hits about 135° rotation from vertical, but when rotating clockwise, the scope stops sharply at 90°. We don’t know why. There are detents at full vertical and every 45°, but they are pretty much informational only since they are slightly shallower than your average aspiring Hollywood starlet! The Razor tripod mount has a standard ¼-inch screw socket and a hole for an anti-twist pin. 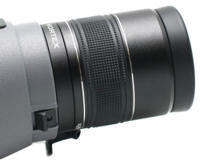 A 20-60x zoom eyepiece is the standard equipment offered with the Vortex Razor HD spotting scope. Fixed magnification wide-angle eyepieces are often a great choice for digiscoping (see below). We did not receive a 30x WA eyepiece for review so we cannot say much about it beyond reporting some of its published statistics. We liked the zoom eyepiece overall. We did notice a slight decline in image quality at the highest magnification under some conditions. To put this in perspective, please note that this is fairly common of zoom eyepieces in general. Some eyepieces are completely useless when zoomed all the way up, which is not the case here. When equipped with the 20-60x zoom eyepiece, the Razor HD scope has a 117-foot field of view at 1000 yards at 20x magnification; this drops to 60 feet at 60x. The 30x wide-angle eyepiece yields a 112-foot field of view at the same distance. Both eyepieces have a minimum of 18 mm eye relief, so the Razor HD won’t present problems for people who wear glasses. The eyecup adjusts upward with a helical counter-clockwise twist. It does not have any stabilized intermediate positions, but the intermediate positions don’t usually collapse on their own. 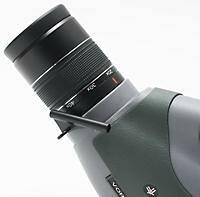 Eyepieces are readily switched in the field, thanks to standard bayonet-type mounts and a nice fully locking mechanism. A sliding button on the prism housing releases the lock to permit changing eyepieces. Unlike all of Vortex’s previous scopes, the Razor HD uses a dual focus knob system. Considering this is their first try at one of these, they did pretty well with it. With the 20-60x zoom eyepiece, we measured the minimum close focus at 18 feet, 10 inches, which is a bit on the long side. Then again, this isn’t all that significant since you don’t really purchase a spotting scope to look at your toes! The only time a short minimum close focus is particularly advantageous is in certain digiscoping applications. One thing we really liked about the Vortex Razor focusing was that it takes only 1.75 turns of the coarse focus knob to go from close focus to infinity. This is really fast response for this, which means this scope is very easy to focus even on a moving target. Overall, we give Vortex very high marks for their focusing system on the Razor HD scope. The lens caps on the Vortex Razor HD scope are both made of flexible black rubber. The ocular lens cap fits easily and snugly over the eyecup, and does not dislodge accidentally. This is a great lens cap. There is even a little tab through which a hole is drilled to permit tethering of the cap to the scope if that is desired. There’s even another bracket on the sighting device that it could be tethered to! That’s a nice little option. By contrast, we don’t like the objective lens cap. It’s a heavy rubber cap that fits snugly into the rim of the objective lens barrel. The problem is, it’s too snug! You can’t get it in without a struggle, and getting it out nearly requires vice grips! Hopefully, Vortex will improve this in the future. On the upside, Vortex also supplies a great padded cordura view-through case as standard equipment with the Razor HD scope. The case features a zipping objective lens portion that has Velcro tabs to keep it open. There is a zipping opening for the tripod-mounting foot to fit through, and then the ocular end zips open leaving two flaps that can attach around the handle of the tripod head, again using Velcro. The padding is thick enough to provide substantial protection for the scope, and even though the Razor is probably durable enough that it doesn’t need this, it certainly doesn’t hurt to have it. The case has two handles for carrying it, and an optional strap that attaches to rings on the case if you prefer to sling it over a shoulder. One caveat: don’t use the handles or the strap unless you’ve zipped the case shut or unfortunate things may occur! We give Vortex very high marks for including this case. It is perfectly functional and includes every desirable option without being clumsy or difficult to use. Other manufacturers charge $60-$200 for a case like this. To provide this free of charge sets a new standard in this regard. Like all of Vortex’s high-end products, the Razor HD spotting scope is backed by the VIP warranty, an unlimited, unconditional warranty guaranteeing replacement of the scope if it requires service or repair. So let’s review here: you get a full-sized 85-mm, HD glass, angled spotting scope that is relatively compact, lightweight and durable, has excellent optical performance overall, is warrantied up the wazoo and even includes a world-class padded case standard, for just $1600. When you consider all that, perhaps it isn’t surprising that the Vortex Razor scopes continue to sell well.